September 06, 2017, 5:00 p.m.
North Korea’s recent detonation of what it said was a hydrogen bomb certainly concerns the American public. 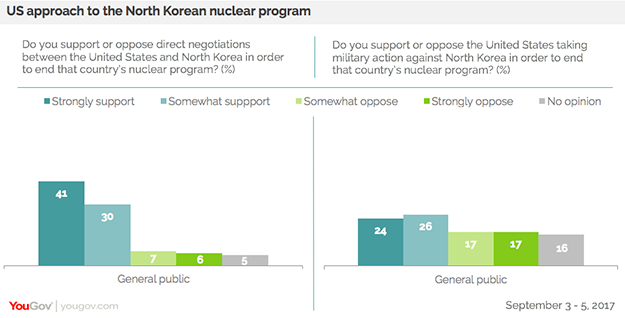 In the latest Economist/YouGov poll, conducted over the weekend when North Korea announced its test, Americans want action taken to end the North Korean nuclear program, with more in favor of direct negotiations than direct military action. Half the public would also favor taking military action against North Korea to end that country’s nuclear program. That’s true even for many of the 71% who support direct negotiations. More than a third would take military action even at the risk of war with China. Both Republicans and Democrats overwhelmingly favor direct negotiations. But the parties part company when it comes to the use of force. Republicans would support military action 72% to 19%, while Democrats oppose military action 50% to 38%. 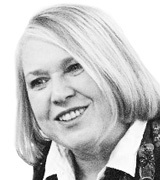 There is little affection for North Korea or for its leader, Kim Jong-Un. By more than 11 to one, Americans have an unfavorable view of Kim, the 33-year old grandson and son of the two previous North Korean leaders. 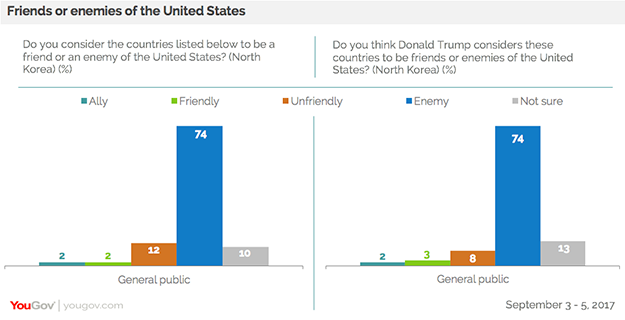 Three in four view North Korea as an enemy, nearly twice as many as categorize Iran that way. And Americans believe Donald Trump agrees with them in his assessment of the so-called Hermit Kingdom. Two in three view South Korea as a country friendly to the US, and by two to one agree that the US has a responsibility to give military assistance to allies when asked. By 42% to 27%, Americans disapprove of the President’s threat to withdraw from a free trade agreement with South Korea. But there is a division of opinion when it comes to the way Donald Trump is handling North Korea. 39% say they approve, 43% disapprove. Democrats and independents disapprove; Republicans approve. And the tests by North Korea and the possible U.S. response has made the public more nervous about war in general. 61% say it’s likely the President will get the U.S. into a war, the second highest percentage saying this all year. For complete results, see Toplines or Tab Report.